The landscape of Wonderland in the second book of Colleen Oakes’s Queen of Hearts series is much darker and infinitely more dangerous than the castle where Dinah the Princess grew up. This Dinah – the Dinah who is on the run through the Twisted Wood – is no longer a privileged girl; she’s a wounded woman. She’s battered and betrayed, fighting all of the what-ifs and should-have-beens continually tumbling through her mind. More than just the scenery changes throughout the book; Dinah herself goes through a monumental metamorphosis. At first, she feels sorry for herself, the pity keeping her locked inside a shell of who she once was. But she soon finds herself on a new path, led by a former adversary – one who she isn’t initially sure she can (or should) trust. Their tenuous trust is further strained when Dinah discovers that the path her protector and teacher is leading her on has brought her deep into the heart of a deadly enemy who does not care that she has been exiled from the kingdom. The Wonderland that Colleen Oakes has created is mesmerizing. There is a depth of persons, places, and things that keeps readers going back for more. She has an astounding ability to draw up all of the small details that complete a scene – and that is a captivating talent to have. It is one of the many reasons that Colleen Oakes has catapulted to the top of my must-read authors list in such a short time. 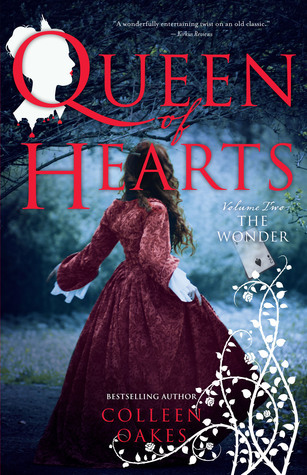 Queen of Hearts: The Wonder pulled me to a cliff-hanger ending and left me marveling at the completely changed heroine at the helm of her story. I can’t wait to march back to the palace as one of Dinah’s warriors – and I can’t wait to find out what’s next for the once and future Queen of Hearts.